This post was updated Feb. 28 at 7:43 p.m.
Treasury Department secretary, Steven Mnuchin, announced Monday a new round of sanctions against Russia to be enacted within 30 days, and said he thinks recent tax cuts passed by Congress will result in increased economic growth in the U.S.
Steven Mnuchin delivered this year’s Arnold C. Harberger Distinguished Lecture on Economic Development, hosted by the Burkle Center for International Relations. Mnuchin, who was interrupted by hissing and outbursts from the audience, talked about the state of economic development in the U.S. and the usefulness of Treasury Department sanctions against North Korea, Iran and Russia. 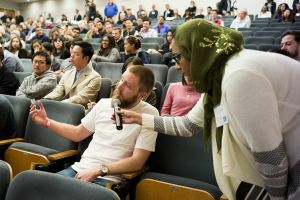 Peggy McInerney, communications director for the UCLA International Institute, said the Burkle Center did not post a video of the lecture following a request from the Treasury Secretary’s office. Kai Ryssdal, host and senior editor of the American Public Media radio show Marketplace, interviewed Mnuchin following his remarks and before taking questions from the audience. In response to an audience question about whether existing sanctions against Russia are being enforced, Mnuchin said the administration currently enforces existing sanctions but will announce a new round within 30 days. He also said President Donald Trump’s administration is working to improve trade relations between the U.S. and China by addressing the trade imbalance between the two countries. Burkle Center director Kal Raustiala said the lecture is intended to showcase a broad range of ideas and perspectives on economic development. “(He’s) the first Trump official to set foot on a (University of California) campus, as far as we’re aware,” he said. Mnuchin frequently engaged with the audience throughout the event, and directly addressed audience members who hissed at him in opposition to his statements about tax cuts. Three individuals were arrested during the event for failing to comply with university police’s orders to stop making a disturbance, said UCPD Lt. Kevin Kilgore. 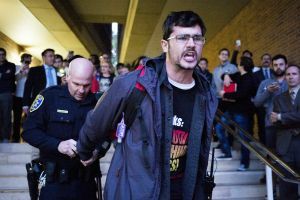 The arrested individuals, members of The Revolution Club of UCLA, include a current UCLA student and alumna, said Atlas Winfrey, a student from the University of Arizona and member of Refuse Fascism. Raustiala said although he disagrees with Mnuchin’s views, he thinks it is important to bring Republican speakers to campus to ensure ideological diversity. “The only motivation here is that he is the sitting secretary of the Treasury and I do think it’s important to bring Republican government officials to the campus,” Raustiala said. Josephine Hai, a fourth-year molecular, cell and developmental biology student, said she attended the talk to learn more about the policies Mnuchin hopes to implement before forming an opinion on them. 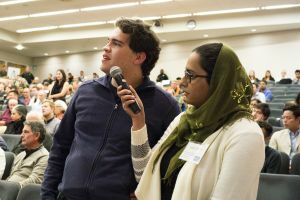 “I’m glad to come to hear what he had to say about the economy, because being a student at UCLA you don’t really get to hear a lot of Republican ideology about economics,” she said. Mnuchin, formerly an executive at Goldman Sachs, Dune Capital Management and OneWest bank before receiving his White House appointment, said his background in banking influences his role as treasury secretary. “I saw the impact of what went on and how important banks are to local communities and the economic issues, and I felt an obligation to try to do things that would help people and help the economy,” he said. Mnuchin said as the U.S. renegotiates trade agreements with various countries, it aims to prioritize benefits to the American economy and American companies. “What is good for the United States, given the size of the U.S. economy, is good for the rest of the world, so when I speak to my European counterparts, they want us to succeed,” he said. Mnuchin’s optimistic outlook on the U.S. economic situation was not shared by many attendees. Abraham Calderon, a graduate student in sociology, said he fundamentally opposes Mnuchin and his viewpoints on the economy because of his background as a financier during the 2008 financial crisis. “He’s a man who’s made his fortune (by) helping lead to the foreclosure of so many black and brown people, poor people across the country,” he said. Shuky Patel, a third-year political science student and the external vice president of Bruin Democrats, said he thinks Mnuchin is an immoral person because he is a part of the Trump administration. Contributing reports from Megan Daley, Daily Bruin reporter. 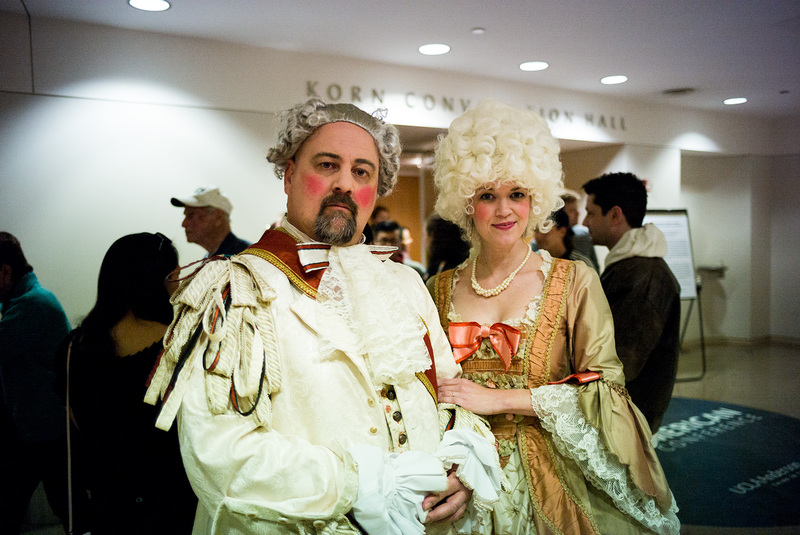 Mike Stutz (left) a UCLA alum and Pamela Mitchell (right) wore costumes to the event. 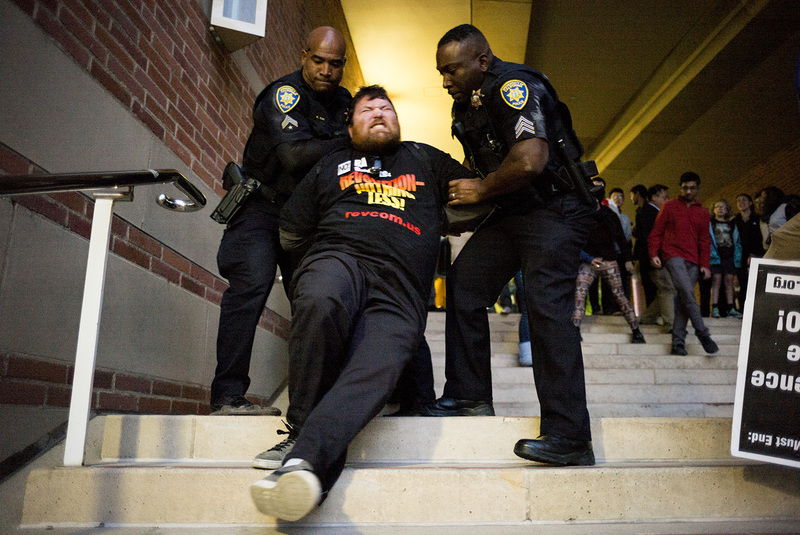 University police arrested three individuals during the event who failed to comply with orders to stop making a disturbance, said UCPD Lt. Kevin Kilgore. The arrested individuals, who are members of The Revolution Club of UCLA, include a current UCLA student and alumna, said Atlas Winfrey (not pictured), a student from the University of Arizona and member of Refuse Fascism. Pretty embarrassing that a lecturer can’t get through a presentation without attempts being made to silence him. I assume most of the audience was respectful, even if they did not agree with his views. This sort of anti-intellectualism by certain groups on college campuses is getting pretty disturbing. Talk about disrespect, why will he not allow the video to be posted?